The conservative Koch brothers are aiming to use their vast wealth to buy a consortium of newspapers. Here’s why you should worry. If their bid is successful, the Koch brothers won’t just have a strong influence over the laws we all live under and the climate we pass on to the next generation, they’ll be publishing the news we read. 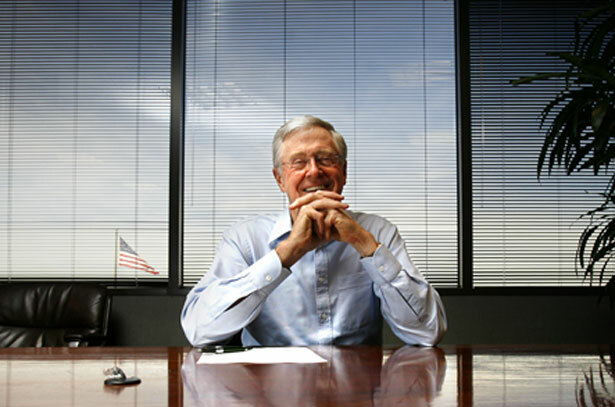 The New York Times confirmed earlier reports that Charles and David Koch are pursuing a bid for the Tribune Company newspapers, which include the Los Angeles Times, the Orlando Sentinel, The Baltimore Sun and many others. 1.) Koch Known for Peddling Politics Through Every Aspect of Business, Philanthropy: One way the Kochs have influenced policy is through large grants to universities and students to pursue research relating to the Koch’s view of how society should operate. Unlike most other academic donors, Koch attaches strings to their grants, dictating how faculty are hired and which research programs can be pursued, as was the case with the controversy at Florida State University. Notably, most Koch ‘philanthropic’ activity is coordinated by the Charles Koch Foundation, which is led by Kevin Gentry and Richard Fink, two Koch Industries executives who double as leaders of the Koch corporate lobbying office, known as Koch Public Sector. As Mike Elk reported, Koch took the extraordinary step of encouraging their employees to vote for Republicans in the last two elections. Even during the fight last year over control of the Cato Institute, Koch attempted a takeover by nominating company lobbyists and loyal neoconservatives to the board of the famously libertarian nonprofit. If Charles Koch is to be believed when he said this year that he would do “everything” he can to persuade politicians, how will the Tribune Company papers maintain independence? 2.) Koch Distorts Science for Profit: Some of Koch Industries’ core businesses—fertilizer, chemical plants, coal shipping, fracking, heavy crude oil refining, cement and petroleum coke—contribute millions of tons of carbon dioxide to the atmosphere and are the reason that Koch is the fifth-biggest air polluter in the country. Though this pollution will ruin the lives and property of many Americans, Koch avoids responsibility by funding a large array of propaganda outlets and think tanks dedicated to distorting the science related to Koch pollution in a bid to stave off regulation. Back in the day, this meant funding efforts to claim acid rain (caused in part by Koch pollution) was a “hoax.” Now, Koch sponsors carnivalesque moon bounces for children to encourage their parents to oppose the EPA’s power to enforce the Clean Air Act, a pledge signed by most GOP lawmakers to avoid action on global warming, as well as many think tanks to provide an ideological or academic veneer for their lies about climate science. “If we win the science argument, it’s game, set, and match,” said Tim Phillips, the political operative hired by David Koch to fight efforts to curb carbon pollution, among other goals. How will Tribune Company newspapers continue their award-winning environmental journalism? 3.) Will the Tribune Reporters Continue to Investigate Koch Influence? : Tribune Company reporters have led in the way in uncovering Koch Industries’ influence in politics and policy. In February of 2011, the Los Angeles Times revealed that David Koch met personally with John Boehner on the first day of the new Congress in the speaker’s chambers, and that Koch’s political spending during the midterm elections helped shape the Boehner’s policy agenda. Last year, the paper reported on a Koch-connected nonprofit that skirted California campaign disclosure laws to funnel $11 million to back two major statewide propositions. Will the papers continue to investigate Koch Industries’ outsized influence in society if the Koch brothers purchase the Tribune Company? Remember when Wisconsin ended collective bargaining rights for public sector workers? Right-wing lobbies plan to do the same thing in Pennsylvania, Lee Fang reports.